Construction workers in ancient China used sticky rice to make a super-strong mortar for city walls and other structures that even withstood earthquakes. Chemists now have discovered the ingredient in sticky rice that made the mortar so strong. Scientists have discovered the secret behind an ancient Chinese super-strong mortar made from sticky rice, the delicious "sweet rice" that is a modern mainstay in Asian dishes. They also concluded that the mortar ― a paste used to bind and fill gaps between bricks, stone blocks and other construction materials ― remains the best available material for restoring ancient buildings. Their article appears in the American Chemical Society journal, Accounts of Chemical Research. 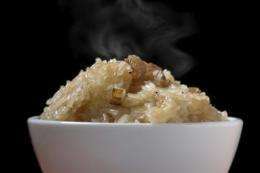 Bingjian Zhang, Ph.D., and colleagues note that construction workers in ancient China developed sticky rice mortar about 1,500 years ago by mixing sticky rice soup with the standard mortar ingredient. That ingredient is slaked lime, limestone that has been calcined, or heated to a high temperature, and then exposed to water. Sticky rice mortar probably was the world's first composite mortar, made with both organic and inorganic materials. The mortar was stronger and more resistant to water than pure lime mortar, and what Zhang termed one of the greatest technological innovations of the time. Builders used the material to construct important buildings like tombs, pagodas, and city walls, some of which still exist today. Some of the structures were strong enough to shrug off the effects of modern bulldozers and powerful earthquakes. Their research identified amylopectin, a type of polysaccharide, or complex carbohydrate, found in rice and other starchy foods, as the "secret ingredient" that appears to be responsible for the mortar's legendary strength. 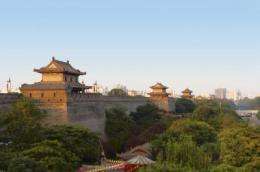 Construction workers in ancient China used sticky rice to make a super-strong mortar for city walls (right) and other structures that even withstood earthquakes. Chemists now have discovered the ingredient in sticky rice that made the mortar so strong. "Analytical study shows that the ancient masonry mortar is a kind of special organic-inorganic composite material," the scientists explained. "The inorganic component is calcium carbonate, and the organic component is amylopectin, which comes from the sticky rice soup added to the mortar. Moreover, we found that amylopectin in the mortar acted as an inhibitor: The growth of the calcium carbonate crystal was controlled, and a compact microstructure was produced, which should be the cause of the good performance of this kind of organic-organic mortar." To determine whether sticky rice can aid in building repair, the scientists prepared lime mortars with varying amounts of sticky rice and tested their performance compared to traditional lime mortar. "The test results of the modeling mortars shows that sticky rice-lime mortar has more stable physical properties, has greater mechanical strength, and is more compatible, which make it a suitable restoration mortar for ancient masonry," the article notes. More information: Accounts of Chemical Research, "Study of Sticky Rice-Lime Mortar Technology for the Restoration of Historical Masonry Construction". maybe todays mortar producers should have a second look at these organic-inorganic composites and experiment with leftover products/sludge from cheap organic waste streams that do not readily convert to biodiesel. When the great wall of China was first built (~2200 years ago), the sticky rice mortar has not been invented yet. When the Mongolians were a threat to China many centuries later, The great wall region were no longer under the control of the Chinese government at that time. That's also one of the important reasons why the military strength of the Chinese government was weak in that era. So, don't blame the wall. By Czech legend a chicken eggs were used in mortar during building of Charles bridge in Prague. This organic additive (or others) plus water repellents could be critical to preventing salt (NaCl) damage to modern concrete- that everyone knows is excessively fragile. It might even slow down corrosion of cheap steel rebar, the basis of modern damage to buildings and bridges. MY, MY! Why hasn't anyone asked for the exact proportions of rice to mortar mix to water? All this historicity and population control argument is in the wrong place. Yes, humans seem driven to have children and grab energy. What a surprise. To paraphrase Philip Wylie's famous comment, "We can all be gay and tea colored." Yes, enough of the off-topic stuff. Can we get the exact formula so we can use this in our own homes? I look to see patented versions of this in stores before long, and and inflated prices. Listen, modern mortars when correctly formulated and applied ought to last over a lifetime. That should be plenty. Do we really want to see suburban backyard BBQ chimneys that last 1500 years? I'd be curious to know if this rice mortar is the mystery mortar used to hold the Cham temple's brickwork together.